One of the primary factors to consider when adopting a dog is the question of shedding. This is because, different people have different tolerance to dog shedding or odor released by the dog’s fur. The most driving factor may be dealing with allergies cases or even dirt brought by the dog. Either case, do not fret. This is because there`re many wonderful dogs that are neither heavy shedders or copious allergen producers. But so you know, shedding in dogs is a natural process. Like humans, dogs will similarly shed a hair or two at one time or another. Therefore, there is no such thing such as completely Hypoallergenic dogs. There is no such thing such as completely Hypoallergenic dogs. However, the more hypoallergenic dogs shed little hair and fewer dander. Thus, they are the ideal choices for the the allergic individuals as well as people who are concerned with the dog dirt yet they still want to own a dog. In this article, we have compiled a definitive guide on the best dogs that don't shed. We have further classified, primarily based on the size and purpose of the dog. Don’t forget to read to the guide section for more details on this subject. What to Expect from Hypoallergenic Dogs? How do you get rid of dog allergies naturally in your homes? 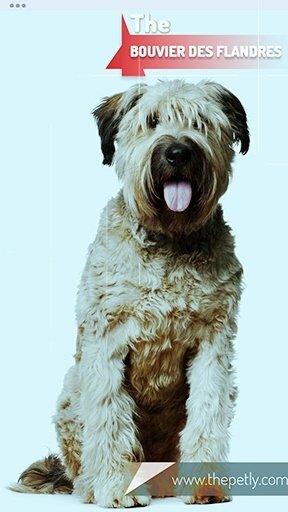 As its name suggests, the ‘Silky' terrier features an elegant, and silky coat that extends from the head to the toes. 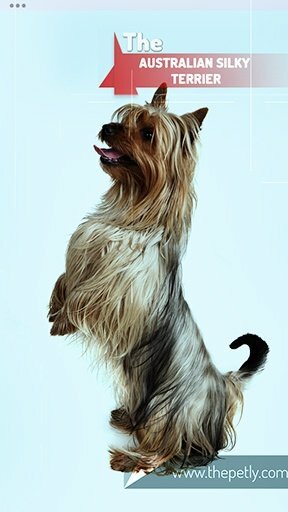 Like all the Terriers, the Australian Silky Terrier is tough and resilient. The Silky Terrier has high energy levels and instantly responds to anything unusual in their environment, making them the perfect canines for guarding homes. Despite their toughness, the Australian Terrier is friendly and affectionate. The terrier has a strong sense of devotion to the family. 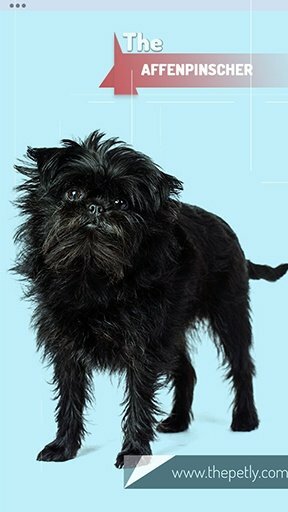 Unlike the Affenpinscher below, however, they`re tolerant to kids, and their patience does not wear in fast. The Silky Terrier, therefore, enjoys the company of children and makes an endearing companion. Originally, the Affenpinscher was bred in Central Europe to keep the rat population down in the stables and farms. The Affenpinscher still carry their fearless traits from the hunting days and have no shortage of confidence. Nonetheless, despite their well-timed spirited antics and charms, these busybodies may at times get a tad mischievous and make the perfect trouble-making companion. Their intelligence and energy, however, makes them fast-learners. Additionally, they have a big heart for the owner and expect the Affenpinscher to liven up everyone`s spirits. The Basenji, which traces its roots in Congo is also known as the ‘barkless dog.’ However, the barkless nature of Basenji is not anything like silent. Though barking is not in their list of options, they do sing and yell. Often, they result to yodels, ‘wooing’, and crying. Meaning, they can be quite noisy as an alternative to barking. 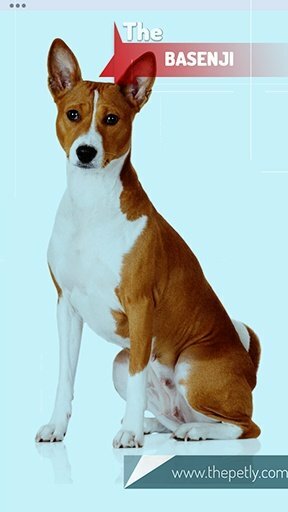 The Basenji is a free-roaming working dog. And since hunting is part of their genes, the sight of any prey or critter often results in an over-drive. Hence, the Basenji cannot be trusted off-leash and don't augur well with home pets. Fortunately, they are wonderful companions, who are always craving for your attention. More importantly, the Basenji is a hypoallergenic dog, thanks to the short, odor-free coat that requires minimal grooming. As its name suggests, the Chinese Crested Hairless is among the few of the dog breeds with little to no hair, save for the fringes on the feet and tail tip. Therefore, they are appropriately classified as minimal shedding dogs. Besides their hairless bodies, a major highlight of the Chines Crested is their elegance and gracefulness, which makes them an exotic fashion statement. The Crested, however, are fairly picky canines, and often prefer the company of their owners over strangers or children. Nonetheless, for the family members and owners, they have nothing to show other than love. 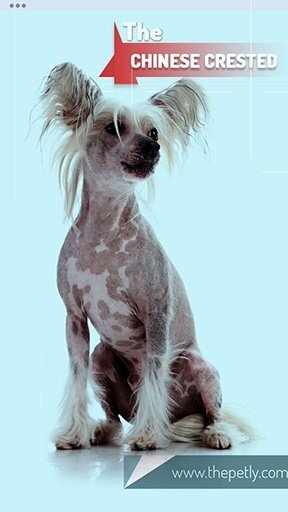 Unsurprisingly, their ‘naked’ skin means that the Chinese Crested hairless does not fair well in the extreme, chilly climate and prefer warm climates. 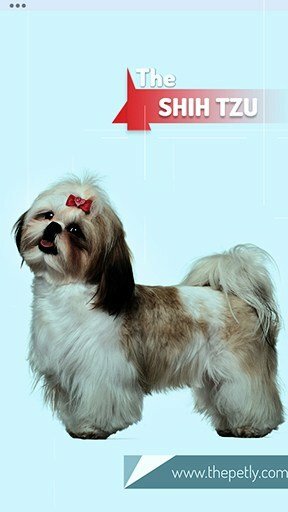 Shih Tzu is a sweet-natured dog, and they will do everything they can think of to make you smile. Unlike the other hypoallergenic dogs, we have reviewed above; the Shih Tzu was primarily bred for companionship. This is to mean that friendliness is in their genetics; they are playful, lovable and always want to be part of the family and daily routine. Though it sports a lion-face and is appropriately named the ‘lion-dog,' the Shih Tzu does not excel in protection. Instead, the Shih Tzu is a happy and outgoing type and prefers the company of a lovely family. Though the Shih Tzu is a low shedding type, this cute hypoallergenic dog is a high-maintenance type requiring brushing of their soft, fluffy coat daily, and regular visits to a professional groomer. The Irish Terrier popularly referred to as Daredevil, thanks to its reckless fire of personality. Tales of the Irish Terrier loyalty, love, pluck, and courage abounds in Irish folklore and music. The Irish Terrier is alert and always looking out for intruders. Besides guarding, the Irish Terriers are pure athletes with remarkable speeds and energy, and it`s not a wonder they excel at agility tests. Alongside the tough-guy attitude comes with a big heart. They love the companionship of children, are compassionate, loyal, and lively. 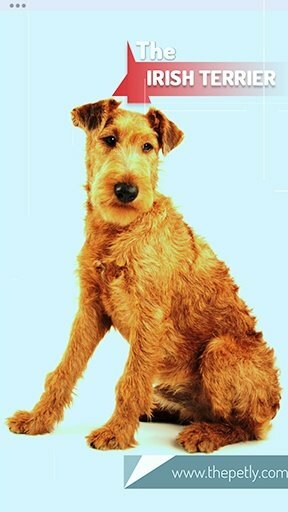 The Irish terrier is distinguished by a solid-red wiry, dense and low-shedding coat. Clipping is effective for occasional maintenance of this low shedding medium size dog. Like all Terrier, the last thing you want is to keep the Irish Terrier bored, else they occupy themselves with chewing, digging, or barking. Typical of terriers everywhere, the Lakeland Terrier has a cocky, confident attitude, and are hardy and active. Originally bred to scare and kill foxes and vermin in farms and stables, the Lakeland Terrier is there to watch and defend what is most important to the owner. As a hunting dog, they`re energetic and agile. Though incredibly intelligent, they are stubborn, therefore requiring more patience during training. Nonetheless, they are friendly companions, who are always showing off their energetic side to impress their masters. Sporting a double-layered, hard, and coat, the Lakeland Terrier is among the hypoallergenic dog breeds that don`t shed and require minimal grooming. The Lakeland Terrier is a lively, and feisty dog that is an ideal fill for the active families. 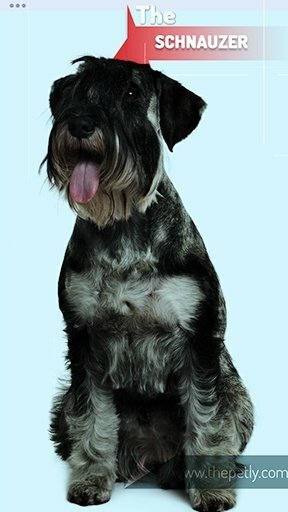 The Schnauzers are energetic and boisterous dogs, which were originally used as herders and farmyard rattlers in Germany. Similar to its close relatives, the Miniature Schnauzer, and Giant Schnauzer, the Schnauzer makes for wonderful companion dogs and will follow your heel wherever you go. The Schnauzer has an extroverted temperament, and you will often find them affectionately curled up in your lap or merrily bounding ahead of you. Like most of the shed-less dogs, the Schnauzer has a double coat that is hard and wiry. You can clip the fur at least three to four times a year to maintain the correct coat texture and body outline. Other than that, weekly grooming is necessary. The Kerry Blue is a native of Ireland, Kerry. The Kerry Blue is a strong-headed, intelligent working, and utility terrier bred that was bred for hunting, retrieving, and herding. The Kerry is distinguished by its distinct grey coat with a tint of blue, alongside a magnificent beard, and mustache. 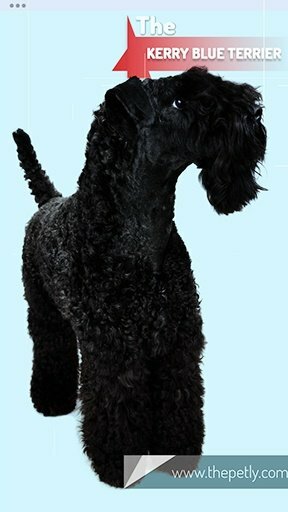 Interestingly, the Jerry Blue is born with a black coat that later transforms to color blue as the dog turns older. Besides working and guarding, the Kerry Blue is a loving companion. They are playful, loving, and energetic. Though they love being part of the family, they may not accept other cats or small pets. The Kerry Blue is a hypoallergenic dog breed, thanks to hair similar in texture to the fine human hair that does not shed. 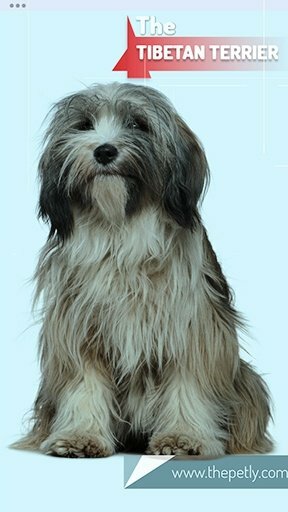 Though it`s called a terrier, the Tibetan Terrier is not a true terrier, and have no relations whatsoever with the terrier. They do, however, originate from Tibet. The dog was bred to withstand the harsh and extreme terrain of the Tibet. This is evidenced by the unusual foot structure, which permits the Tibetan Terrier to travel easily on snow. So, if you enjoy snowshoeing and other winter sports, this low shedding dog is the perfect option. The local name for the dog is Tsang Apso, which loosely translates to ‘shaggy dog,’ The word is appropriately fitting, thanks to the distinct long coat. The double coat is profuse and fine, making the Tibetan Terrier among the list of dogs that don`t shed. Like all its terrier relatives, the Airdales are an all-around dogs breed that does not shed. With the Airdales, it easier to list what these nonshedding dog breeds cannot do than what they can. 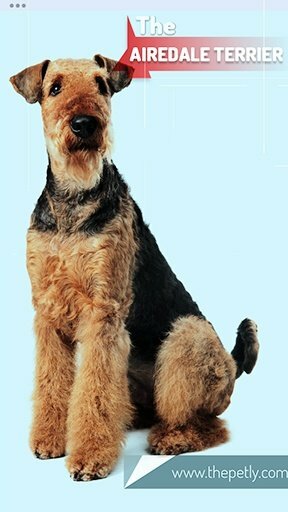 The Airedales excel at guarding homes, protection, agility, obedience, and intelligence. Moreover, they are highly energetic, therefore requiring intense and regular activities, including swimming. Their high intelligence and socialization traits make them sensible guards, and though protective they are often willing to accept newcomers and visitors once their families welcome them inside. 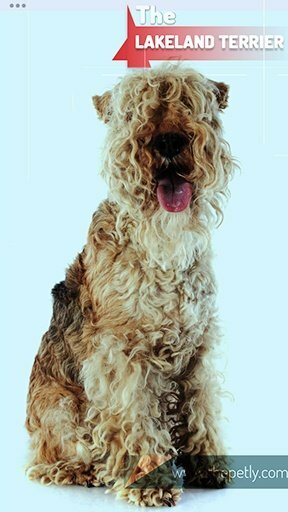 The Airedale Terrier is a robust nonshedding breed with a hard, wiry coat that requires minimal maintenance, save for grooming several times a year plus weekly brushing. The Komondor is a fierce and loyal Hungarian dog breed that does not shed. The Komondor s instantly recognizable for its ‘dreads.’ From afar, the Komondor looks like a giant mop on legs and a wagging tongue. The exotic looking dread coat serves the Komondor as an excellent feature to protect the dog against external elements including injuries by predators. However, the dread coat comes at a cost too; the coat demands a lot of maintenance because just like a mop, it collects dirt quickly. 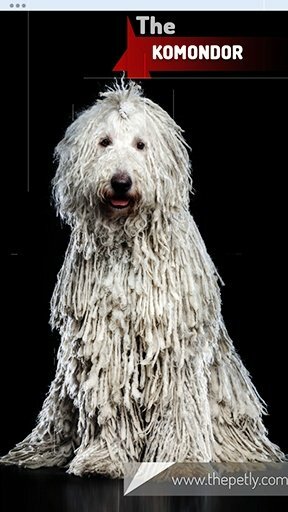 Fortunately, the ‘cord’ do not shed or release strings of hair, making the Komondor a perfect hypoallergenic dog. Though gentle, the Komondor is fiercely loyal to the family as far as becoming increasingly territorial towards those they don`t trust. 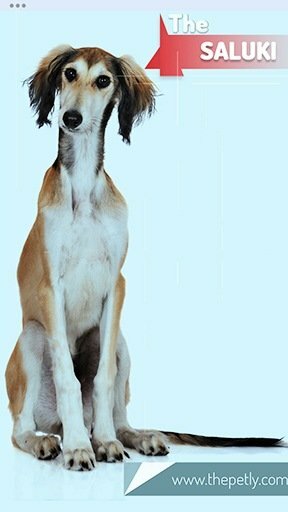 The Saluki is among the oldest dog breeds and is believed to have existed over 6,000 years ago. Saluki dogs are shy, but always content to be in your presence. However, they are not keen on expressing love and affection. Nonetheless, you will appreciate their calmness and gentleness. Though they are highly intelligent, they are not keen on training. They are smart enough to understand your commands but are also quick to ignore them. The Saluki coat is extremely smooth, soft and silky, and does not shed much. This low shedding dog will, therefore, require minimal maintenance - a weekly brushing is sufficient to keep it neat. The Bouvier was originally bred to herd cattle near the Belgian town of Flanders. His name means ‘cowherd from Flanders.’ But alongside herding, the Bouvier performed other tasks including guarding and drafting. Of course, with the huge stature comes confidence and a lion`s pride. The Bouvier is truly brave, responsible, and protective. This big dog equally comes with a dense coat that requires a lot of brushing and grooming to keep it sparkling clean. The Standard Poodle originated from Germany as water retrievers. Of the three Poodle varieties, the Standard Poodle is at the top of its class with incredible intelligence. Besides intelligence, the Standard Poodle is hardy and athletic. Training the Poodle is an absolute joy as they are keen to please their owners. Though they have a ‘dainty’ look, they are overly affectionate and hearty animals that cherish little rough play and long runs. 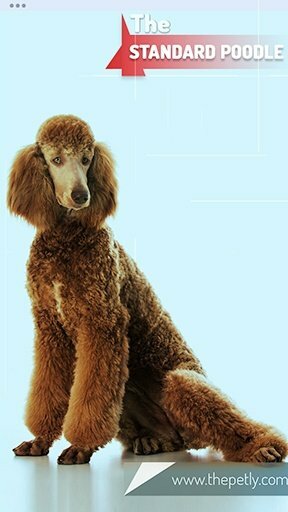 A major highlight of the Standard Poodle is that these hypoallergenic dogs are known for being virtually odorless. All types of Poodles have curly hair that needs regular grooming to keep them healthy. Though the Poodles form part of the short-haired dogs that don`t shed, the short hair still needs brushing weekly. If you are in search for a dog that will be part of your family without sacrificing on your coziness or resulting in allergies, then you are in for a treat. In this section, we shall highlight the best family dog that is affectionate, yearning for companionship, and most importantly, it’s hypoallergenic. Also, known as the Westie, this non-shedding dog type is an active, little dog. It`s hardy and its territorial too. Just like its family of terrier, it can be quite protective of its family. 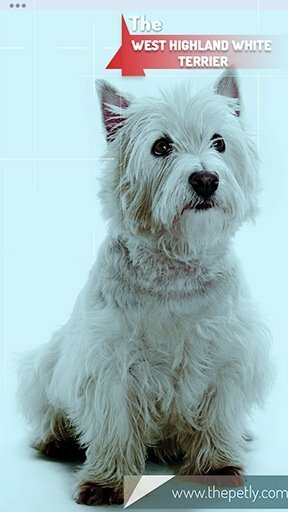 The Westie sports a double-coat, which is hypoallergenic, and easy to maintain too. For a family needing something cutie and playful, this is the dog for you. It’s small and energetic you’ll love it on the first sight. In fact, just to brag about its fame, it has been on the top third of all dog breed in America since the 1960s. The Whippet does not release any odor, allowing you to make discreet movements in your hunting grounds. More importantly, they are the ultimate sprinters with unmatched acceleration staggering in the range 35 miles per hour - a whopping 56 km/hr. Their dexterity makes them the cheetahs of the dog world. Or as others name it, "the poor man's racehorse." Needless to say, they perform extremely well in dog racing competitions. As such, since it is the world best accelerating dog, they are great for hunting rabbits, hares, or small animals on sight. That is to say, if you are looking for a strong dog for wilderness best for hunting hogs and other larger animals, probably the like of Pitbulls family will suffice for that case. Nevertheless, the Whippet fur does not shed, and an occasional rub down is sufficient to keep their coats gleaming. If you are a hunter you know how important is your tools. But most important, it’s your close associate in the hunting grounds. Having a reliable friend besides another human is worth a day toil in the wilderness. This is to say, you simply don’t need any other dog, only the best. 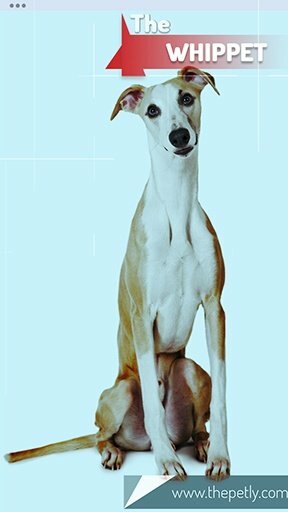 And if you are keen to blend both courage and non-shedding, then the Whippet one of the best of hunting breeds. As we had earlier stated in the introduction, shedding in dogs is a hormonal change, and all dogs undergo shedding. However, there are dogs which are more prone to shedding, and the amount of shedding is what classifies between non-shedding dogs and shedding dogs. Shedding is as a result of a myriad of factors ranging from the temperatures, your pet`s level of nutrition, and their general state of health. Besides the natural causes, your dog may also shed after whelping puppies, surgery, traveling, or even anesthesia. Either way, non-shedding dogs are often low maintenance and release relatively smaller amounts of fur. Dog allergies are caused by the dog dander and not the hair or fur as it is commonly perceived. Dander is the dead, flaky skin that falls off the dog. The low-shedding dog breed is more hypoallergenic, meaning that they release less of allergens through flaky dead skin and dander compared to other breeds. It`s a common myth that low shedding dogs are low maintenance. That`s further from the truth. Low shedding dogs are not necessarily low maintenance. The matted hair on hypoallergenic dogs is painful if left unchecked because it pulls on the dog`s skin. Consequently, it can result in permanent hair loss, and therefore, it`s vital that you regularly maintain your low shedding dogs for their comforts as well as appearance. Besides brushing your dog`s fur to avoid matting, regular grooming is of equal importance as it rids the pet dander. Since no dog is strictly hypoallergenic, and will always produce some level of dander, it`s important that you enlighten yourself on how to manage dog allergies. Remember that even the hypoallergenic breed can cause an allergic reaction if they are not taken care of due to the build-up of allergen-related proteins on the skin. Let`s cut the chase short and look at some of the effective ways you can deal with dog allergies or dander. One of the most effective strategies against shedding and dog allergies is by dog grooming. Regardless of whether your dog is a low-shedder or not, grooming is not only necessary to keep your dog neat, but also allow natural oils to flow through the coat. A healthy coat that is free of the mat will not only prevent over shedding but also save you time and energy of visiting a professional groomer. If your dog is the indoor type, they will on many occasions leave their fur and dander trail on the couch, carpet, and even your beddings. Therefore, it`s crucial that you regularly vacuum your entire household to get rid of the loose air and trap the allergens in your home. If you are sensitive and allergic, it would be recommendable that you keep at least one room of your house a restricted zone for the dog. Ideally, your bedroom should be a no-go zone for the dog, because it`s where you spend most of your time when indoor. However, this will require training and willpower, especially if your dog is used to sleeping with you. You can use a central purifier fitted with HEPA filters to remove the allergens as well as the loose fur. Besides removing the allergens, the central air filter will supply a constant flow of fresh and cool air. Feed Your dog with tasted and balance diet dog food. It`s a reality that every dog is going to shed. And we humans, as mammals, it`s understandable since we shed too. Furthermore, we also produce dander for one reason or another. However, for the hypoallergenic breeds we have listed above, they tend to shed a great deal less than other breeds. When you brush and groom your dog regularly, you can expect to find minimal fur around your home. Regardless of the type of dog that you own, make sure to observe your dog’s health and fur maintenance. Hi there, it seems like yesterday when the guy from the animal shelter took my two beloved dogs. It was a decision reached by my parents when I could not manage to give Molly and Sadie proper care. To cut my past loses, when I graduated from college, I volunteered in the animal shelter. For the next six months, I learned everything about animal care. Today, I am returning that favor to every pet parent through ThePetly blog for free.